As autumn is finally here and we are about to spend more time indoors, enjoying our needlework, period movies or a good book over a nice cup of tea, I thought it was time for a picture post. In line with my current project for the HSM “Inspiration” challenge I have put together a little collection of extant Georgian pockets to marvel at. Now you might say: “Wait, wasn’t she working on a 17th-century costume and what about her usual Regency stuff? Why is she getting side-tracked by pockets?” Well, here is the thing: I am one of those people whose handbag is always full of little bits and bobs in modern life. At events this has proven tricky in the past. No Regency reticule can hold all my stuff. Alternatively I brought along a lidded wicker basket or a nondescript cloth carrier bag. It worked but was not the most period accurate solution. Then I remembered Georgian pockets. They were still around in the early Regency era which I love so much. And since my new crossover gown has a drop front with deep plackets, pockets wear easily undeneath. The next consideration was what to do for my 17th-century costume. This was what initially made me research pockets. 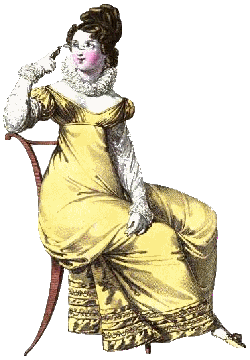 Sources often say that ladies wore them between the mid-17th and 19th centuries. Since my gown dates earlier than this, I wondered what had gone before pockets as we know them. And I found the saccoccia, a belt pocket worn in Renaissance Italy. It had roughly the same shape but was worn outside the skirt more often. For more details on the saccoccia, I recommend this in-depth post by Anéa Costume. For now, Georgian pockets will be my fix-all solution for both periods. Knowing my 17th-century persona, she would be cheeky and inventive enough to stick the pockets under her skirt, even before 1650. But now, I will just stop rambling and show you all these pretty pictures! Pair of embroidered linen pockets, mid-1700s, Worthing Museum and Art Gallery. Embroidered and quilted linen pocket, with silk binding, early 18th century, MFA Boston. Pair of pocket front, embroidered by Hannah Haines, c. 1718-20, Victoria & Albert Museum. But, even in the old days, not every lady was a super-skilled embroiderer. Pockets were a welcome canvas to practice not-yet-so-perfect needlework skills. This is why I am in love with this one from the early 1800s. Embroidered wool twill pocket, c. 1807-15, Winterthur Museum. Quilted linen pocket, c. 1760-75, Victoria & Albert Museum. Also often associated with quilting, is patchwork, which was extremely popular with pockets, too. Examples come in many shapes and sizes. There is patchwork with bigger squares…. Patchwork pocket from New England, c. 1800-10, Winterthur Museum. Pocket, early or mid-19th century, Royal School of Needlework. Patchwork pocket, New England, 18th century, MFA Boston. … or patchwork with applique. Pieced and appliqued pocket, American, late 18th or early 19th century, auctioned by Crocker Farm. Pocket made from block-printed calico, English, c. 1720-30, Winterthur Museum. Cotton calico pocket, early 1800s, Manchester City Galleries. Cotton pocket, late 18th or early 19th century, private collection. These are making me think of 1950s horse shoe pockets often seen on dresses and aprons. I wonder if there is some sort of connection? Did these lead to those? They have very similar shapes and both were often big and deep. And the tie on aspect of an apron and these is quite interesting to ponder. That is a very interesting question! Shape-wise, later pockets definitely evolved from earlier ones, like 18th-century pockets are very similar to Renaissance pockets. The connection to aprons though, hmm. As tied aprons definitely existed at this point, and were worn over a dress including pockets, there might or might not be a connection to apron pockets. By the way, some extant Regency aprons already had small weld pockets attached. Very pretty. The embroidery is so detailed. Thanks for sharing.